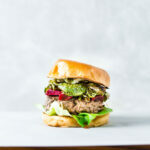 Super easy, delicious and healthier bison burgers. These big, juicy bison burgers are cooked in a cast iron skillet for a delicious crust then covered with melty cheese and your favorite toppings. There are few things that bring more joy than biting into a big juicy burger that packs tons of flavor. For this burger, we’re switching it up a little and using delicious ground bison. I’ve had a bison ribeye in the past, and the flavor was unbelievable for being a much leaner protein than beef. I was recently inspired to pick up some ground bison after seeing a friend post how delicious it was in some burgers she was making. Most specialty grocery stores carry ground bison nowadays, but Costco definitely has the best deal on it. 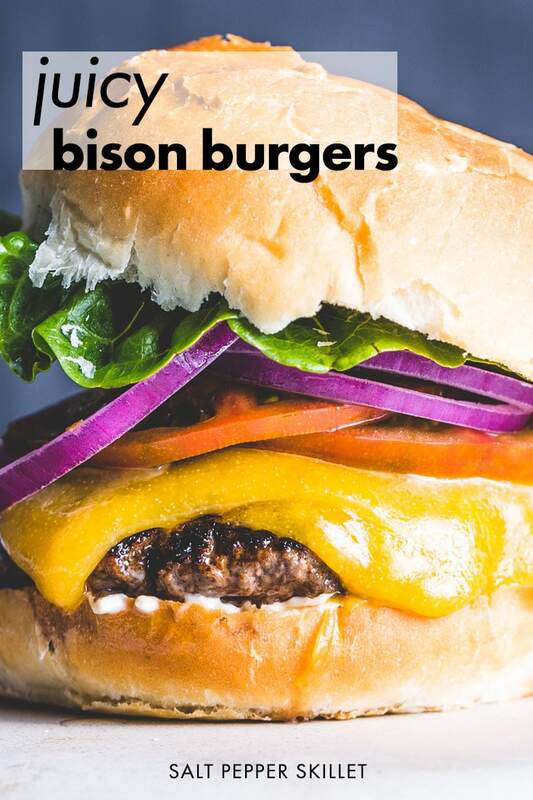 If you are looking for a bison burger near you because you have heard how delicious they are; chances are you might want to just make your own. Unfortunately, not a whole lot of restaurants have bison burgers on their menus yet. Not only is bison healthier than beef, but it’s also an excellent source of lean protein. It’s lower in fat than beef but has even more rich flavor to it. Using grass-fed bison is an excellent source of omega 3 acids, which are the healthy fats. To make this an even healthier bison burger recipe, you can go protein style and substitute the bun for lettuce. This is a great way to cut carbs and also get to taste the bison even more. Nope, bison does not taste gamey and there is no aftertaste that is often associated with game animals. The flavors of bison are very similar to beef, but it is slightly sweeter. So what’s difference between bison and buffalo anyway? The two names are often used interchangeably, but American Bison are native to North America and Buffalo are from Africa and Asia. You can read more details about the differences over at Modern Farmer. The best value you are going to find for buying ground bison is definitely from Costco. It is also often available at Sprouts, Whole Foods and other grocery stores. Since the ground bison is low in fat (usually 10%-15%), I much prefer to cook the bison burgers with a little butter in the skillet instead of oil. 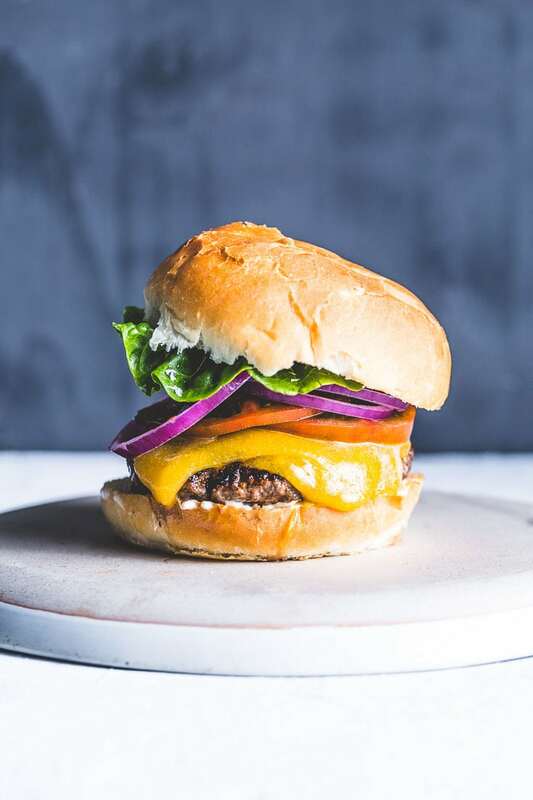 This helps with browning and creating a delicious caramelized crust on the outside of the burgers while cooking at a lower temperature so they don’t dry out. How to cook bison burgers on the stove in a cast iron skillet: Season the burger patties generously with kosher salt and freshly ground pepper. Heat a cast iron skillet over medium-high. Add about 1 tablespoon of unsalted butter per burger, swirl it and place the burgers in the skillet. Turn the heat down to medium to cook the lean bison burgers more slowly for about 3 to 4 minutes per side for medium-rare. With how delicate and lean these burgers are; my preference is to sear them in a skillet. The grill will definitely work and add some great smoky flavors, but they can dry out more quickly and it is a little more difficult to handle them. You can totally go crazy by adding different spice rubs, garlic powder and other seasonings to bison burgers. My preference is just to season them liberally with kosher salt and freshly ground pepper. This really lets you taste the rich flavor of the actual bison. If you want to kick it up, try adding toppings instead (see below). A fried egg can add a wonderful richness to the lean yet flavorful bison. Crispy fried shallots are amazing, sweet and add a nice texture. 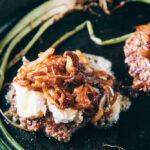 Fry up some green onions/scallions in the same skillet that the burgers are cooked in and add on top of the burger. Blistered shishito peppers totally kick it up. All these toppings can be cooked in the same skillet as the burgers so you aren’t making extra dishes. Bison burgers are also great bunless. Top with some smoky bourbon bbq sauce for a more steak like option. What cheese goes best with bison burgers? Go with either a nice cheddar or havarti cheese on the bison burgers. Melting a few slices of brie can also be great. Handle the ground bison gently. Too much mixing can make it tough. Cook them rare or medium-rare. Bison is a very lean protein, so it will dry out quickly if overcooked. It is best cooked rare to medium-rare. A great way to make the bison burger patties is to divide even portions into round balls, then place them in between two pieces of parchment paper on the backside of two plates. Gently press the plates together (not too far) to form perfectly even bison burger patties. If you are going to have any leftover bison meat; it’s best to only cook what you need and save the rest to cook for your next meal. Re-heating the lean bison in the microwave the next day can cause it to dry out. Since it cooks so fast, it’s much more optimal to just fry up another burger instead of eating leftovers. Gently form patties with the ground bison that are slightly larger than the diameter of the buns, as the meat will shrink slightly when cooked. Heat a cast iron skillet over medium-high heat until it just starts to smoke. Season the patties generously with kosher salt and freshly ground pepper. Add the butter to the skillet, swirl it, then immediately add the patties. Reduce the heat to medium so it doesn’t cook too fast. Cook for about 3 to 4 minutes per side, or until the desired temperature is reached (medium-rare or medium is recommended). Add the sliced cheese about 2 minutes before the burgers are finished cooking to melt. While the patties rest, toast the buns either in the hot skillet or in the toaster with a thin layer of mayo applied to the inside of the bun. Serve with sliced onion, tomato, lettuce and whatever you love on your burger. Bison meat is super flavorful, so use minimal sauces so you can really taste it. Quick, dirty and delicious. 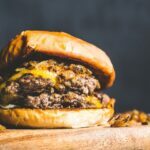 This is a super flavorful flat top cheeseburger with caramelized onions that you will really want to get down with. 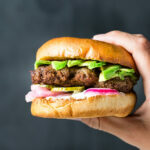 Lamb smash burgers accompanied with quick pickled red onions & baby cucumbers, a yogurt-mint sauce and sliced avocado. Tons of umami flavor. Woah!! What a burger! 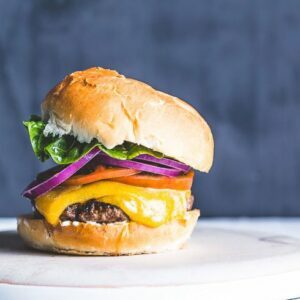 We’re celebrating National Cheeseburger day at the Lazy Gastronome by inviting other bloggers to share their amazing recipes. I would be honored if you shared this one!